I'm sure Hooman said "doggie" - he's humungous! Wow, you are very brave to get that close to a big donkey. Enjoy today! 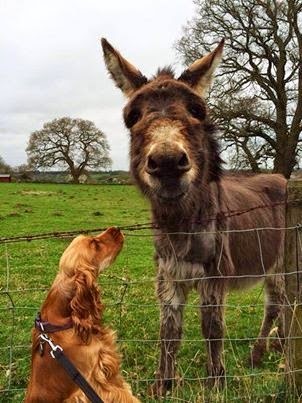 It's wonderful to see when a dog meet a friend of another species. Have a wonderful Wednesday! What a cute friend you have, Lottie! HeeeeeeeHaaaaawww! What a great photo! BTW, Joey dog thinks you look a lot like our patron saint, Miss Charisma Dog. I did not have the honor of knowing her since she had passed by the time I came to this home. But Joey says Charisma was like a mom to him when he was a puppy. Charisma was an American cocker spaniel, but looked more like and English one. He says she was very beautiful! Cheers from Chester! I do believe they enjoyed meeting each other, great picture!